I’ve been using RabbitMQ to deliver live prices to my VisualSpreads trading app. The getting started section of the RabbitMQ website is actually very good, it explains the concepts in a very easy to understand format. The only downside for me(being a .net coder) was the lack of .net code in the examples, I thought it would be probably added at a later date but I just checked back and it still doesn’t(as of now) exist. 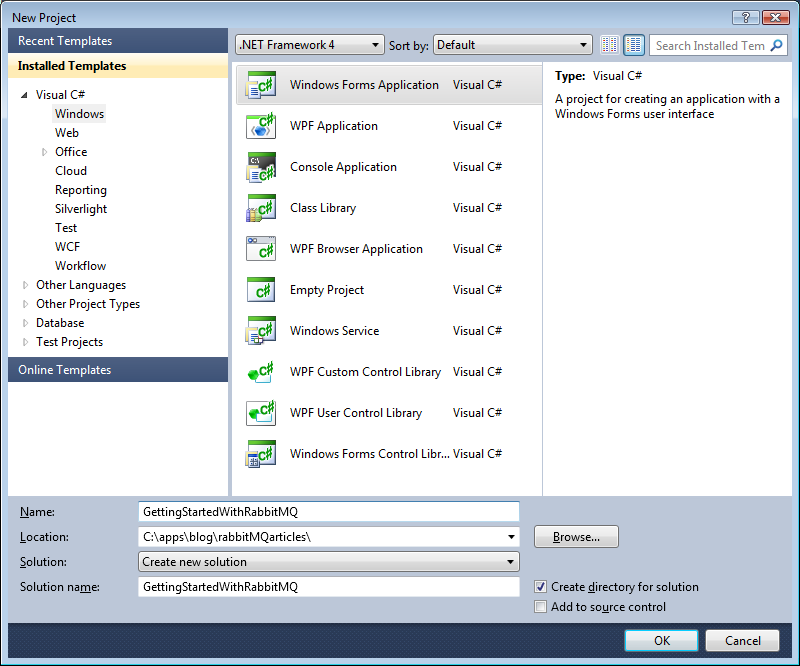 I’m planing to do a series of articles that mirrors the existing examples but in c# .net and this is the first. I’d recommended reading each article on the RabbitMQ website before reading my .net version as I’m only adding the missing .net code. Download the source. In comparison to the Java example we can see one main difference, in the .net client library we have a IModel interface instead of a concrete Channel in Java. We store the Model, Connection and QueueName in fields so we can use them in the SendMessage() and Dispose() methods. Next up is the consumer. Add a new class with the name(surprise surprise) Consumer. This is a very neat way to run a method on a new thread. In this example we invoke the Consume method using ConsumeDelegate. This is required as the Consumemethod contains a blocking while() loop. If we ran this on the same thread as the UI, the UI would become unresponsive and hang the application. We could also pass parameters to the method using a delegate/method with a different signature e.g. Whats happening here should all be pretty clear. We create the Consumer and Producer instances and start listening for messages from the consumer. When the button is clicked we take the input from the TextBox and send it using the producer, the consumer receives the message and passes it to our handleMessage through the onMessageReceived event. 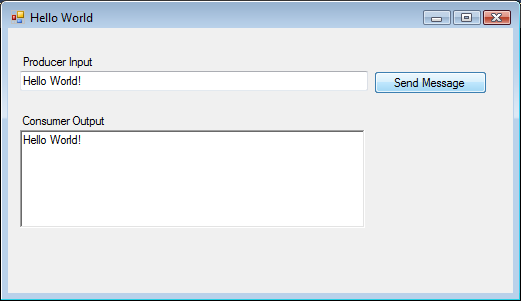 We then use a delegate to ensure we update the output RichTextBox on the containing Form thread. Messages are serialized .NET types. Routing is also based on types. It’s very early days, and certainly not production ready yet, but I’d welcome any feedback. I like your approach, subscribing to message type as opposed to an exchange/queue. I’m going to download your code and have a look. Be warned, this is using an old version of the RabbitMQ client, i’ll update it soon. Simon, first of all I must admit its an awsome article specially when somebody really needs the same. Thank you soo much for providing us helping material with working example. 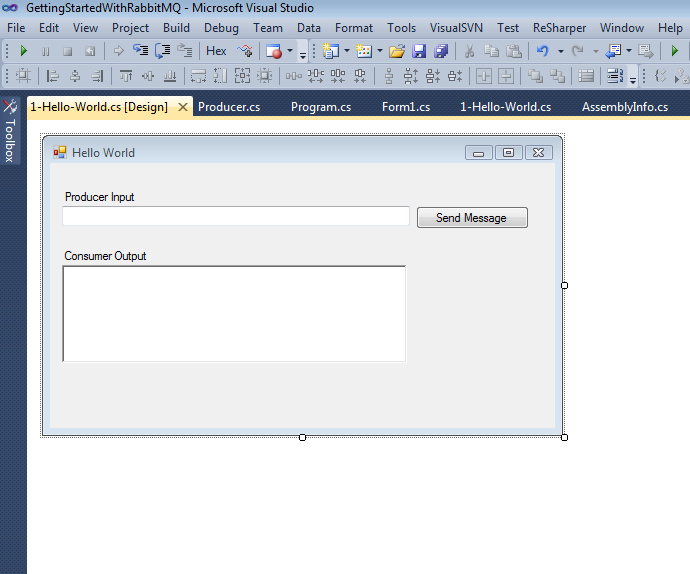 Excellent article, this is thee goto ‘Hello world…’ example for RabbitMQ in a .Net based GUI environment. I’ve just started looking for a messaging infrastructure that supports pub/sub right out of the box. Lots of great products, but amazingly none of them seem to have a sample (like yours) that is designed to run in a windows GUI. Can’t understand how this could have been missed by so many vendors, Rabbit ought to pay you something for this great intro. Well thanks again, this sample will save alot of time and extremely useful to ‘agile up’ to something that runs immediately that can be used to iterate off of. I’m trying to create a similar code with an option to remove the consumer. For this purpous, I need to implement the catch and use the BasicCancel() action. Could you give me some tools to do this? Quick question: I see by default the messages are durable. If I do several producer.SendMessage calls without listening, then kill the service, all messages are lost. Is there a preferred way (on Windows) of persisting the messages? But I have a problem with the code. When I close the Form, the Consumer not finalize properly. Hello, I have a question, is there not an event to let me know if I get a message instead of creating a loop and be wondering about the boolean variable? Can re-upload the source code for RabbitMQ part1,part2 & part3 since, i click the link it’s empty. In addition the try and catch instruction within the Consumer.cs doesnot compile since the field catching the exception is not defined or changed somehow. Just remove the reference and this would compile ok. Excellent article, I have created demo application from this code. It works perfectly. But one thing that i am not able to figure out is that “Application is not closed” completely even if i close it from title bar. Can you help me out with this issue? Can you please re-upload the source codes for RabbitMQ part1, part2 & part3. Your original Link is not working.